Posted on August 16, 2016 by thelostlighthouse	in Gaming, Podcast and tagged 5e, 5e actual play, 5e live play, 5th Edition, actual play, Assassins, Cult of the Dragon, D&D, D&D 5th edition, DnD, Dragons, Dungeons & Dragons, gaming, half dragons, live play, pen and paper RPG, podcast, Rise of Tiamat, role playing game, RPG, The Lost Lighthouse, TLL, tllgaming, Total Reroll, Tyranny of Dragons, Wizards of the Coast. The gang has come up with a plan to stop the dragon cult from raising Tiamat and generally ending the world as we know it. But as they lay down to sleep for the night, suddenly assassins attack! 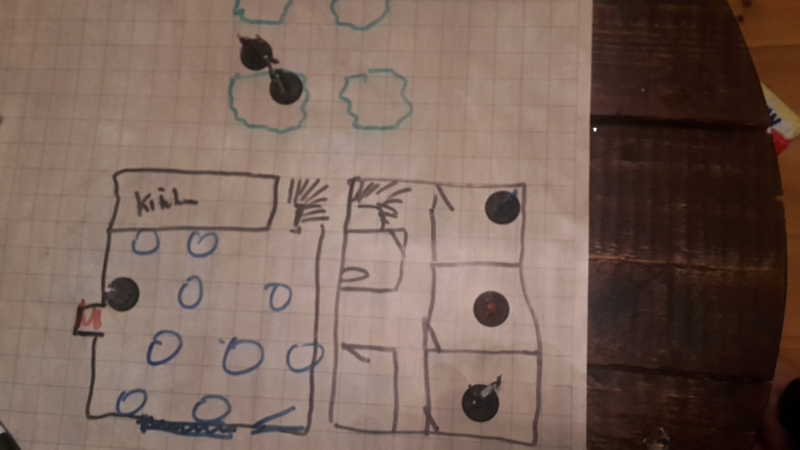 Map of the fight before the assassins turned up – Left is the downstairs of the Minotaur’s Secret, where Nausicaa was sleeping (scribble says ‘Kitchen’, blue circles are tables, stairs in the corner) Right is the upstairs, with Red, Ravoprax and Eldo each in a bedroom. Top are the trees over a mile away, where Ravoprax and Froomie decided to spend the night.